Sociologists call the scarcity of urban grocery stores vs. the abundance in suburbia "the grocery store gap." It's particularly wide in Detroit, the nation's beleaguered 11th largest city, where there are no chain grocery store outlets within the city limits. The Wall Street Journal(subscription required) opined on this phenomenon recently, and then CNNMoney.com followed suit. Detroit isn't alone. Last year, the Washington Post bemoaned the lack of conventional groceries in both Washington DC and New York City, and mentioned a similar situation in Philadelphia. 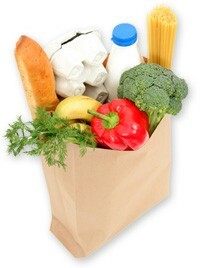 In New York, the mayor's office appointed a "food policy coordinator" to encourage the opening of more grocery stores. In Detroit, where the unemployment rate is 22.8%, the school system is considering bankruptcy and 30% of the population gets food stamps, the lack of conventional grocery stores doesn't get a staff position. In fact, there are grocery stores in Detroit: The discount grocer Aldi Inc. has two outlets within the city limits. According to the Food Marketing Institute, this limited-inventory approach is the grocery store of the future. And there's the Eastern Market, the 43-acre wholesale outlet and farmer's market that draws suburbanites and well as city dwellers. And there are independent groceries. I met the owner of one of them two weeks ago when my husband and I went to the Gold Cup hydroplane races on the Detroit River. The store owner had moored his 58-foot yacht on the straightaway and was hosting a bash for friends and family. One of them told me the grocery business is tough, and the store is only busy on days when the vouchers and the checks are distributed. But obviously, things aren't that bad. For the second time, we asked you, our AOL users, to tell us which grocery stores bring you pleasure ... and which bring you pain. And your responses surprised us! We expected the message boards to be teeming with stores that drive you crazy. And there was some of that, but as it turns out, there also seems to be many great supermarkets out there. Click through our gallery as we highlight 12 new posts about stores you detest and 15 you adore. Then click on to see last editions' 30 best and worst picks. · Post: Which Grocery Store Do You Love? Wegmans is an experience! I live in Allentown, Pa. and I am a realtor. In every area tour for relocatees, I include a stop at Wegmans. (Usually for lunch). It usually seals the decision for these people to agree to move here. Thank you Wegmans! ... P.S. Their barbequed chickens are the best anywhere and the most reasonably priced. They make a great quick, last-minute low-cost dinner. Hannaford in Waltham, Mass., is the best supermarket. The produce is beautiful and they have a good variety of ethnic foods. Also, their staff is really friendly and helpful. [Their] meat tastes like dog food, the fish like Clorox bleach and Nine Lives. It's always filthy in there, and I [have even] seen a mouse in the cat food aisle once. Safeway is so overpriced. I don't understand why anyone shops there. Raley's, right across the street, is way cheaper. Example: The same liter of olive oil is $24.97 at Raley's, but $32.95 at Safeway. This is just a sampling. It is the same all over the store. According to Fortune magazine, this company is the 13th best company in America to work for! Their prices are low and customer service is impeccable! I can't believe no one mentioned Dierbergs in St. Louis. It is a destination in itself. I used to live in Houston and had to shop at Seller Brothers and the meat has so much fat in it that it is hardly even pink. You could not buy [their meat] one day and cook it the next, unless you put it in the freezer (not the fridge). If only I had known then. When we are traveling through Minnesota, we always make sure that we stop a Lunds. They are always extremely clean and the selection is incredible, especially the "gourmet" areas. The displays are always very attractive. I wish we had something as nice in Southern California. A former North Carolina native, I still miss the cleanliness, variety and yes, the curb side service at Harris Teeter. There are not many stores that I am aware of that allow you to drive up to a loading station where attendants load your groceries into your vehicle. Right on, Harris Teeter! Three years ago, a story in the Detroit Free Press noted that this particular grocery had the highest number of food inspection violations in the state during the three-year period from 2003 to 2006. It was cited for moldy pizza, expired infant formula and spoiled lunchmeats, among other things. The management defended the operation saying, "It is a lot of pressure. You have to worry about robberies, purse snatching. ... They want you to run the store like a chain store. We are trying to do our best, but it is not easy." It all boils down to money. A report from business consultant McKinsey & Co. says in order for an individual grocery store like Kroger's to survive and thrive, it must gross $15 million to $20 million per year and net an average of 6% of that. An independent grocery that opened last year in Detroit with help from the Detroit Economic Growth Corp. grossed $110,000 a month for 10 months before it went belly up. In order for people to patronize high-volume grocers, they have to have money to spend, a car to transport them, and a place large enough and secure enough to store what they buy. Many Detroiters have none of these things. And until prosperity returns to the city -- they never will.